Steering axis inclination is NOT adjustable. It is designed into the suspension of the vehicle. If the angle is not correct, then the suspension system should be checked for damaged or worn parts. Replace the parts to correct the problem. Toe-out on turns, also known as turning radius angle, is the amount the front wheels toe-out when turning corners. As the vehicle goes around a turn, the inside tire must travel in a smaller radius circle than the outside tire. To accomplish this, the steering arms are designed to angle several degrees inside of the parallel position. The exact amount depends on the tread and wheelbase of the vehicle and on the arrangement of the steering control linkage. Toe-out on turns is NOT an adjustable angle. If the angle is incorrect, it is an indication of damaged steering components. Figure 8-52 shows toe-out on turns. Note how each front wheel turns a different number of degrees. This prevents tire scrubbing and squeal by keeping the tires rolling in the right direction on corners. Tracking (fig. 8-53) is the ability of the vehicle to maintain a right angle between the center line of the vehicle and both front and rear axles or spindles. (The rear of the vehicle should follow the front wheels.) With improper tracking, the vehicle rear tires do NOT follow the tracks of the front tires. This causes the vehicle body or frame to actually shift partially sideways when moving down the road. Poor tracking will increase tire wear, lower fuel economy, and upset handling. 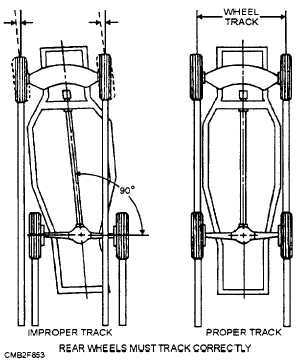 Improper tracking has many causes, such as shifted or broken leaf springs, bent or broken rear axle mounts, bent frame, bent steering linkage, or a misadjusted front end alignment. Figure 8-52. - Toe-out on turns.